This week had a stormy start here in the Midwest that left me with some unexpected days off from weaving. I did get another towel woven on the red warp on Monday and part of a double weave bookmark. At the end of the day, I loosened the tension on both looms and went upstairs as normal. 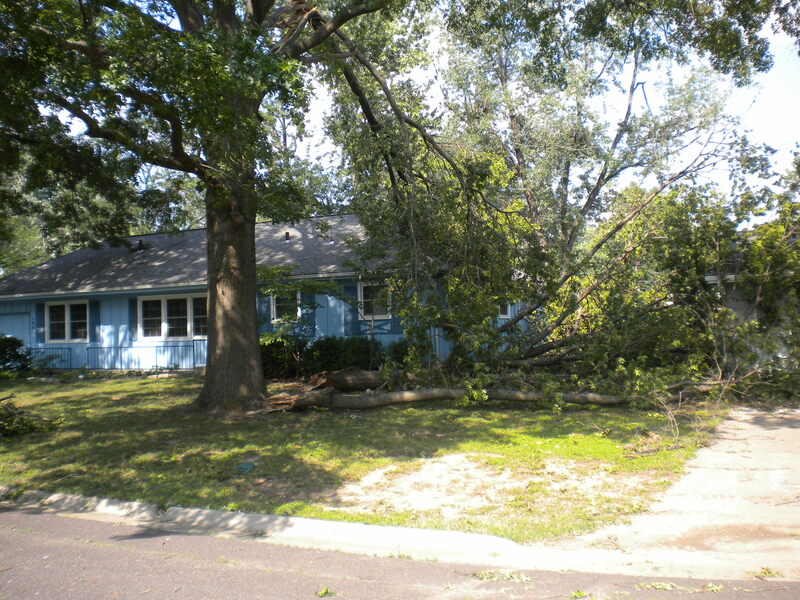 However, Monday night we had straight-line winds that knocked out the power and a good portion of a couple of our trees. So this week I’ve been outside picking up sticks, waiting for call-backs from tree companies and insurance, and basically waiting around until the power came back on and I could see enough to work downstairs. We are grateful no one was hurt here and our thoughts go out to others not so lucky in other parts of the Midwest and points east. The power came back on late yesterday, so now it is back to work. That’s scary-looking weather! I hope the rest of your summer is calmer so you can enjoy it! Thanks! And may you enjoy your summer as well.